I’m going to show you two ways that help me keep my bathrooms fresh and clean. 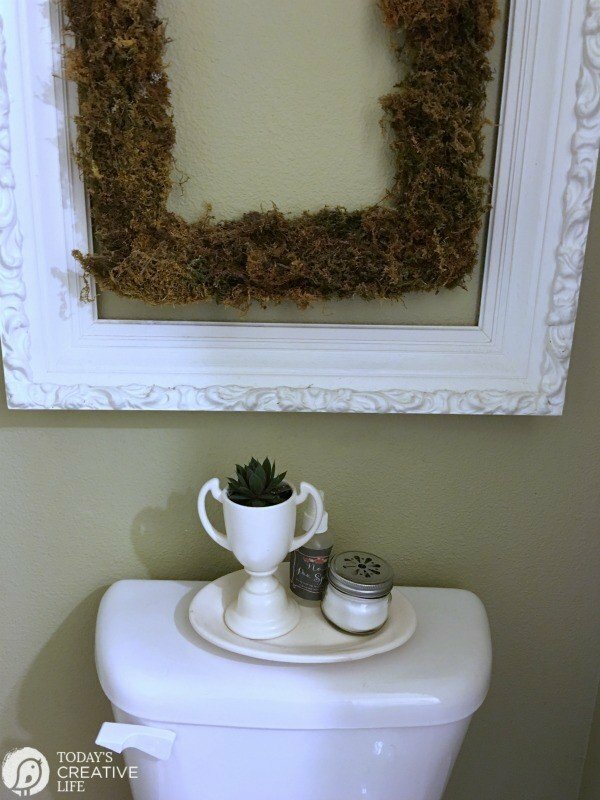 My Homemade Air Freshener Recipe helps keep your bathroom smelling fresh and clean, even when it needs a quick wipe down. 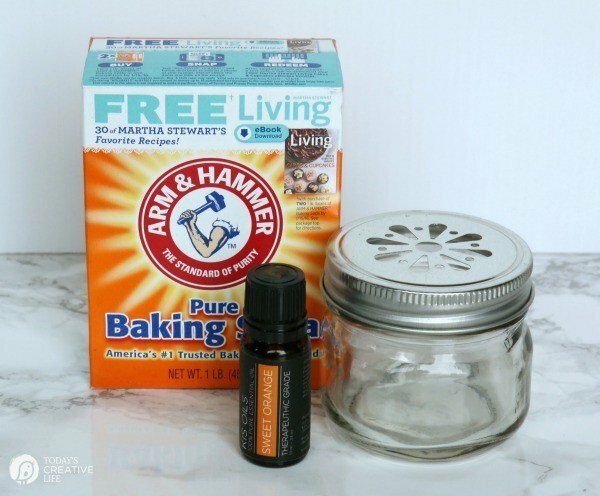 Toxic-Free Air Freshener is easy when you make it yourself with essential oils and baking soda. 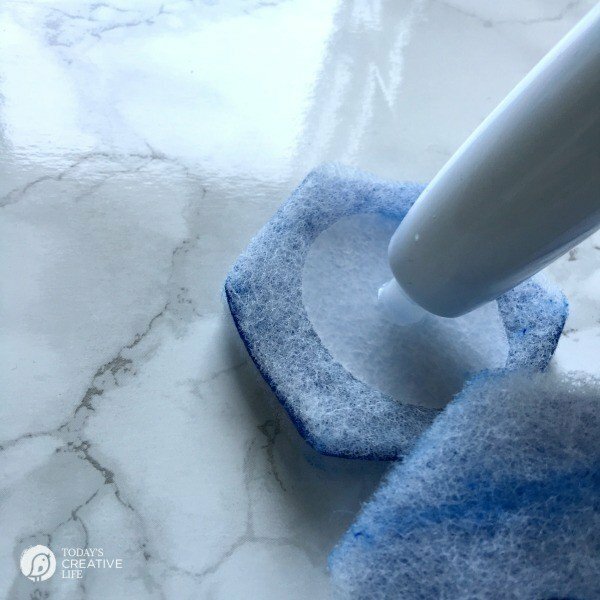 With 4 bathrooms in this house, I’m always on the lookout for simple handy cleaning tips and tricks that make it easy to keep them fresh. Bathrooms can get gross really quickly, especially the toilet. Even though I have a housekeeper that comes every two weeks, we still need to clean the toilets a few times a week. 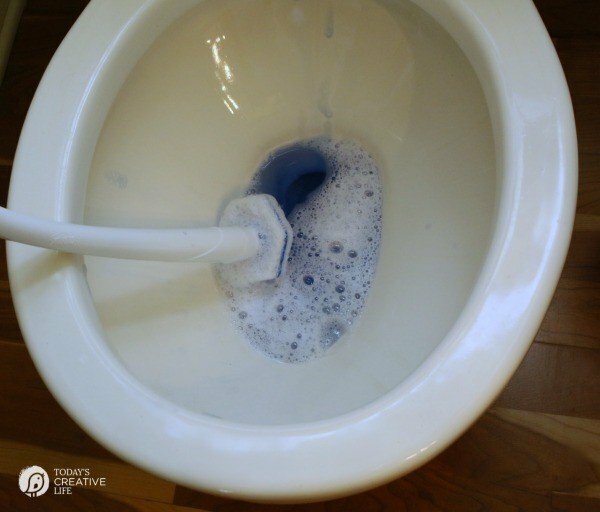 Clorox Toilet Wand: I have learned that if I supply my bathrooms with this instead of a regular toilet brush and cleanser, it will get used more often by the males in the house. I don’t have to worry about a dripping gross toilet brush as they put it back and we KNOW they aren’t rinsing it and if they do, I doubt they are then cleaning the sink. That’s why I was thrilled to work with Clorox again and remember why I loved these toilet wands to much! A clean bathroom is a cleaner bathroom, which means it’s going to also smell better. 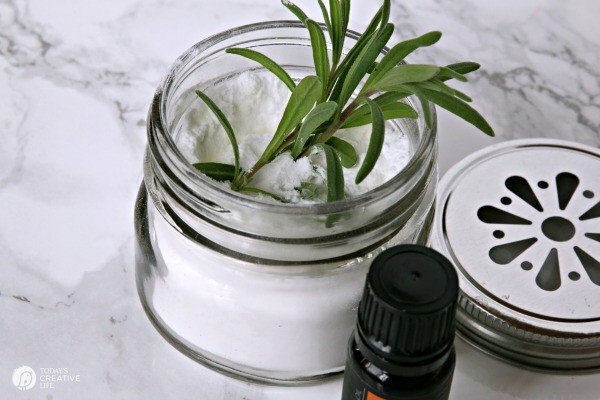 Homemade Air Fresheners: I make my own with baking soda and essential oils and herbs. Tutorial below. 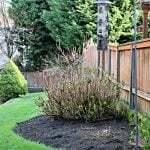 You will love how simple this is and how you can use it in many different areas. This Wand is all about making a dirty job less dirty. You can find them in the mop and broom aisle, and everything else you need to tackle your cleaning at Walmart. You’ll want to start with the first package, then stock up on refills. The wand itself will last forever. 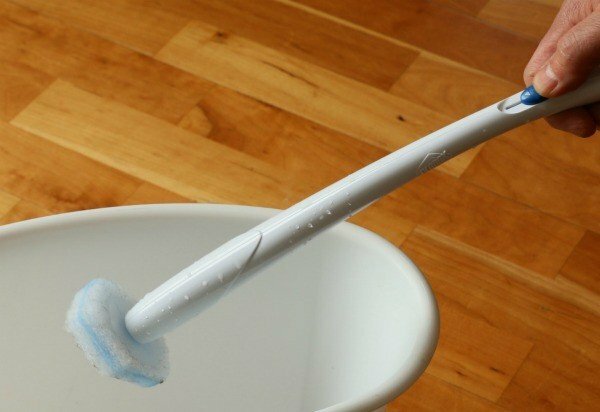 Each scouring pad easily attaches itself to the wand with a simple push. 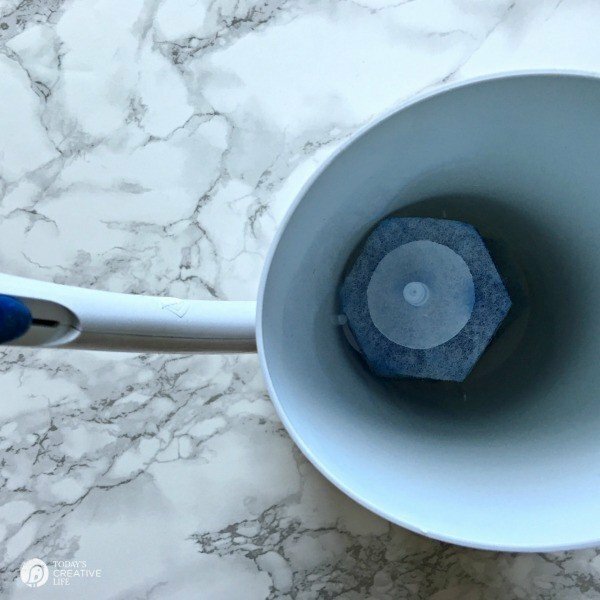 The disposable cleaning head preloaded with toilet bowl cleaner attaches to the Toilet Wand handle to power through tough stains while killing 99.9% of germs. Once attached you’re ready to give the toilet a quick swish. The scouring pads cleaning solution is activated once wet. It’s shaped well to get under the lip of the bowl and all throughout. 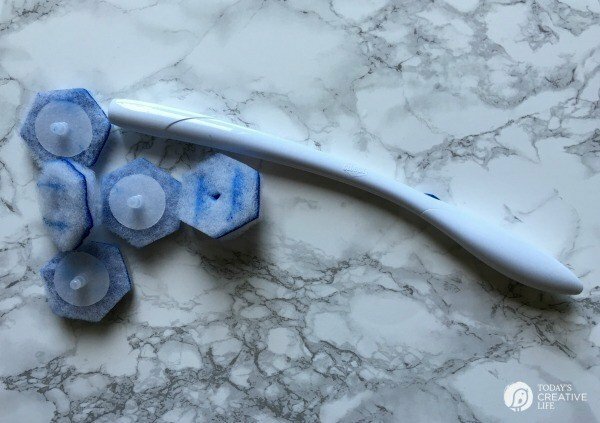 Say goodbye to your icky toilet brush! Just click, swish & toss! Once you’re finished, you simply hold the wand over a trash can and push the blue lever. The dirty scouring pad will pop off and into the trash. When you need a new scouring pad, they are stored in the handy canister. 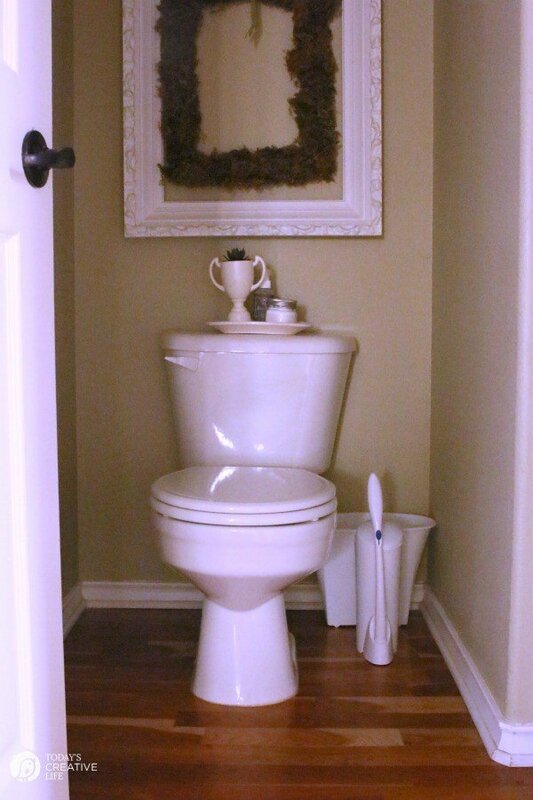 The canister is attractive enough to sit out next to your toilet, or short enough to put under the sink if you have room. No more searching for the cleanser or the toilet brush, everything you need is right here. For back up, I keep my jar of homemade air freshener on the back of the toilet. Jar with a slotted daisy lid. You can also use a regular lid and nail a few holes. Pour baking soda into your jar, almost to the top. Drop in several drops of essential oil on top of the baking soda and stir. I used Sweet Orange and Lavender. About 20 drops each. Add a sprig of lavender or rosemary. Any herb will be great. You can also add dried lavender into the mix. Place your lid on and set it in your desired space. These are great for the car or any room, or closet. 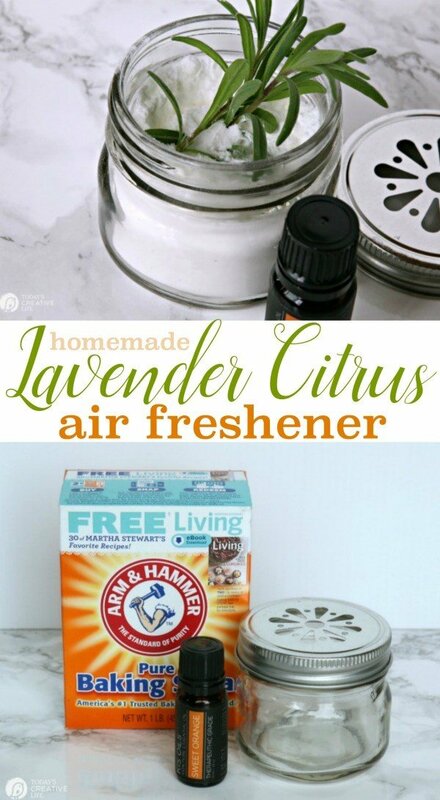 Try making air freshener in your crockpot too! 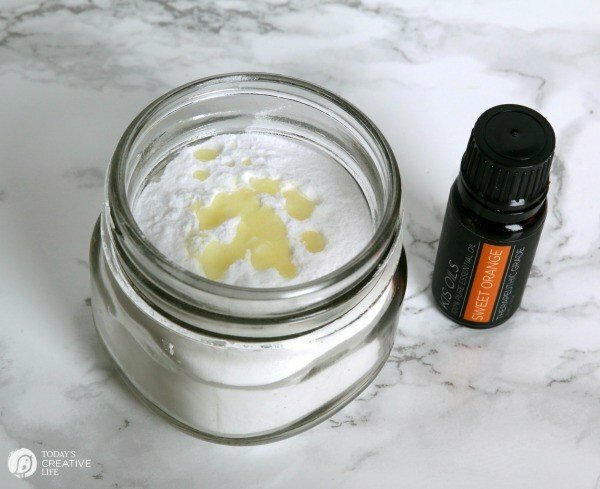 Homemade Air Freshener made with baking soda and essential oils are toxin- free and much more eco-friendly. I love the variety to choose a scent for each bathroom. Here’s to a home that’s clean and fresh smelling for spring! I would love to know where you can find the slotted jars. I have never seen these before. The lids can be found on amazon. They were just a normal canning jar.